Last Monday, I went down to London, hoping to do a bit of Christmas shopping by bike. The day before I signed up for the Brompton hire dock. For £1 annual membership, you can hire a Brompton for £5 a day. It is available from quite a few train stations, such as Oxford. It sounds a fantastic idea. Get a train and then cycle around the city. In the end, I decided not to hire a Brompton. I got put off by the notice you had to carry it with you at all times; they don’t allow you to lock it up outside whilst you go into shop. In the end, I thought I might as well take my battered old commuting bike. Save £5 and less worries about getting the bike stolen. From Paddington, it’s a short stretch to Hyde Park. It was quite pleasant cycling around Hyde Park. There is a decent bike path, with enough room to have a separate path for pedestrians. At one point though, I saw some signs to say bike path was closed because it was Christmas, I couldn’t quite work out why. The shared bike facility works well, if you’re not racing and have a little patience. One or two cyclists came flying through a busy intersection with bell ringing loudly hoping people would jump out of the way; it’s the kind of approach that doesn’t really help to get more shared cycle facilities. I came across some tourists who had just had hired some Boris bikes. They obviously had a few difficulties with handling the 25kg bikes. One tourist veered impeccably across my path completely unaware of where she was going. Fortunately, I had a little bit of that generous Christmas spirit; I was going relatively slowly and could anticipate the random movement. It would have been different, if I was cycling at top speed. As much fun as it was to go round and round Hyde Park, I needed to venture into the hectic world of central London and try and find a nice cafe to eat, and possibly a few shops to visit. Although, the media can exaggerate the dangers of cycling; it’s hard not to be conscious of the recent spate of serious accidents in London. 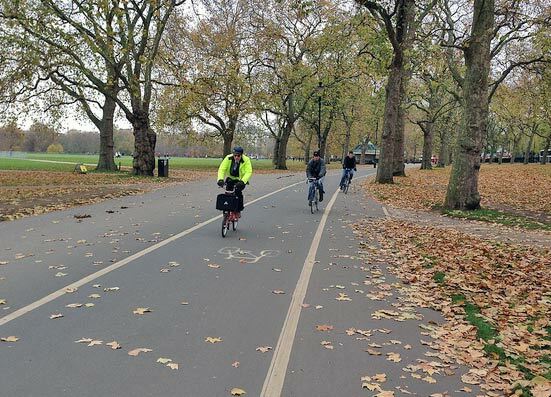 November was a grim month for London cyclists, no matter how you look at it. I was cycling in defensive mode. – trying to anticipate dangers, not in a rush, following rules of the road, not taking any unnecessary risks. If I was a Londoner, I might be able to find the best cycle route East across London, but I didn’t have the patience to examine multiple maps, so I just headed West, trying to follow suitably looking quiet roads. The cycling can best be described as stop start; it’s a bit of a jungle out there. It’s definitely hard work cycling through London, I don’t really envy London commuters, though it’s not as bad as recent headlines make out. The main problem is that you are sharing roads with innumerable buses, lorries, vans. On one occasion a van did a quick three point turn in the road. It was a good job I was on my toes, I had to reverse onto pavement to make sure he didn’t reverse into me. But, apart from that, it was relatively incident free. But, you have to ride with a heightened sense of awareness more than anywhere else. For what it’s worth, I would never dream of cycling around London with headphones on. I always go to London with the great intentions of having a fantastic time, visit loads of shops, find a great cafe. But, after 20 minutes of cycling towards Covent Garden / Soho, the London experience was already getting a little tough. I had no idea where I was, just going from side street to side street. You pass so many cafes, you keep think you’ll find a better one; so end up going past many. After several cafes came and went, I was investigating one cafe, only to notice it was the Rapha cafe! I know Rapha from somewhere, O yes! the cycle team and cycle clothing company. Sometimes, it does work out just rambling through London. I went into the Rapha cafe and shop. I eyed a very attractive winter jacket; it looked superbly designed and made. Though it didn’t have a price tag, and I was too shy to ask. It would make an excellent Christmas present, if Santa Claus reads this blog. It was a good place to hang out though. Lots of cycling memorabilia and magazines and a good cycling feel. 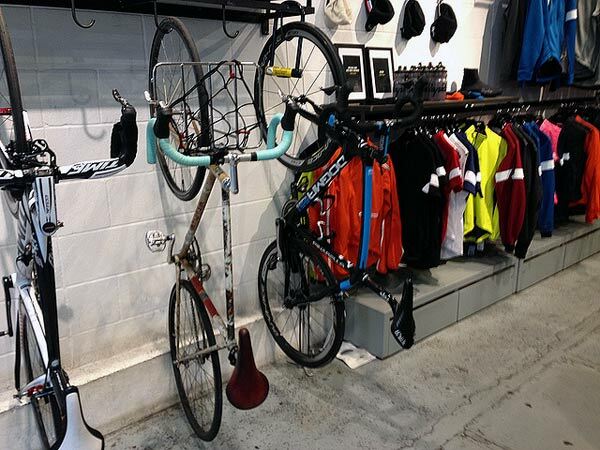 The shop has a convenient rack to hang a bikes. I couldn’t help but notice these two bikes next to each other. 1 an immaculate Team Sky issue Pinarello Dogma. The other, the most battered old Merckx commuting bike you could imagine. And the battered Merckx is probably the best choice for cycling in London! After a good lunch at an excellent nearby cafe, Bills, I started to head back to Paddington. Though, I thought I ought to make a cursory attempt at shopping. I chose a five floored Waterstones in Picadilly, but my heart wasn’t really in it. London is too big a place to shop. And I was thinking more about the vague cycle route back to Paddington. Rapha Cafe and shop. 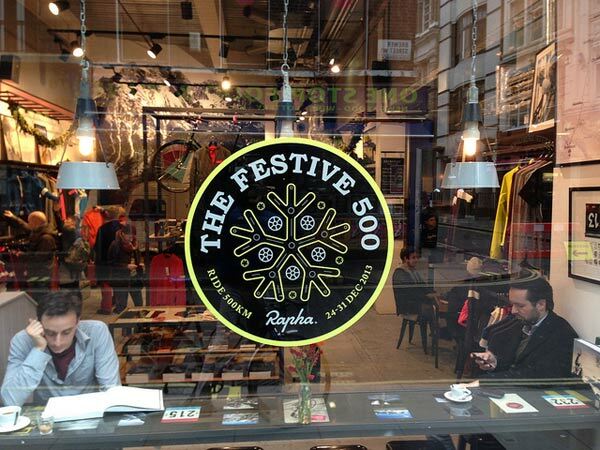 The Rapha Festive 500 is a challenge to ride 500km between Dec 24 and Dec 31. Taking the bike on the train was fine, and it was good having a bike to get from Paddington into Central London. I thought it was difficult cycling into Oxford, but after a day in London, I realise there are much harder places to cycle. It’s hard to add anything to what has already been said about cycling in London. 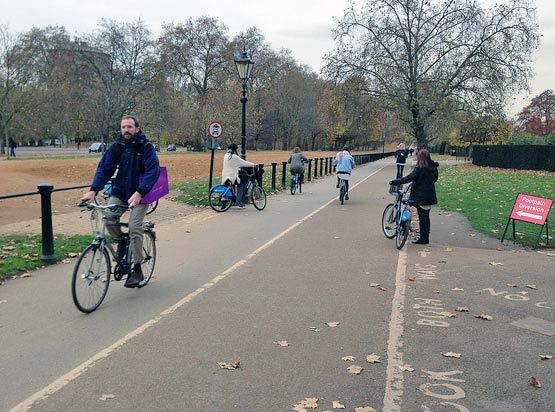 Except, it would be great if London could be made more accommodating for cyclists. 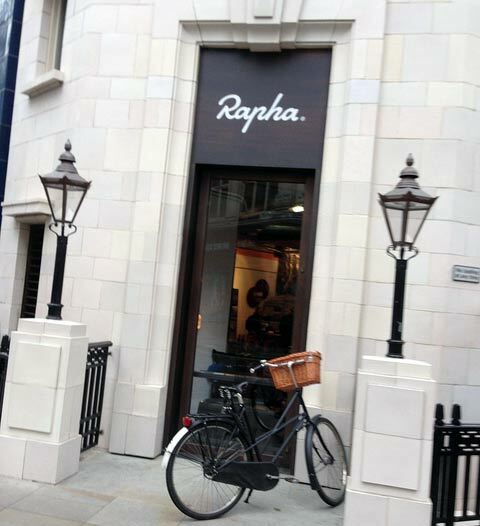 It was an interesting experience and I was glad to come across the Rapha shop and cafe. Cycle statistics – how safe is cycling?